Everyone loves a celebration, which is why nobody is sad when Carnaval is in town! Click here to play! The colors, the music, the food, the sheer vibrance of thousands of people partying on the streets... 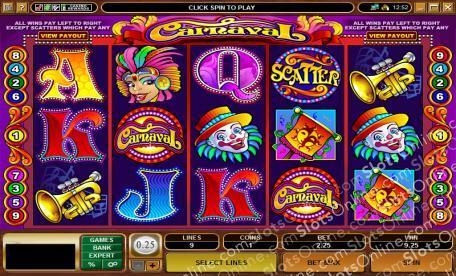 There are many reasons to love a Carnaval, and the Carnaval slots could give you thousands of reasons more. Pick up a trumpet and play your way to a fortune, or raise the Carnaval banner and watch your balance shoot to the stratosphere before your eyes. You could caper with a clown or dance with a Carnaval girl in an outrageous headdress. All that matters in Carnaval is that you have a blast while you try to win obscene amounts of money! Come on down to the Carnaval today! The festivities need a King and Queen before they can begin, and this Carnaval could make a fortune for its monarch. The scatter symbol pays out on the total bet when 3 or more stop on the reels. 3 pay twice the bet, 4 pay 10 times the bet, and 5 symbols pay 50 times the total bet. The Flamboyant Wild symbol substitutes for any symbol other than the scatter symbol.